Arab terrorist who tried to stab a policeman in the Old City identified as Ahmad Mahameed of Umm al-Fahm. 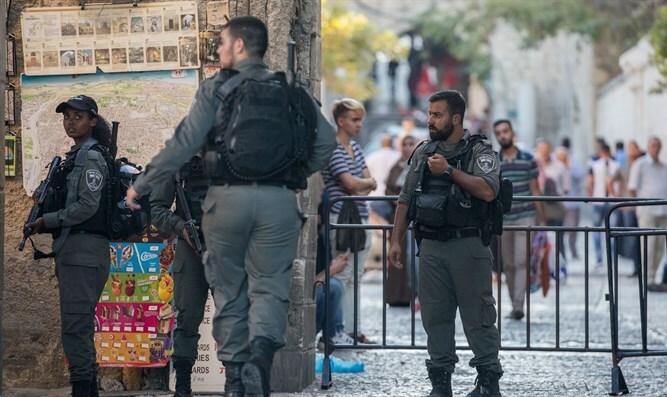 The Arab terrorist who tried to stab a policeman in Jerusalem's Old City on Friday afternoon has been identified as Ahmad Mahameed, it has been cleared for publication. Mahameed, 31, is from the Arab Israeli city of Umm al-Fahm, which is located in northern Israel, about 20 kilometers (12 miles) from the Palestinian Arab city of Jenin. The attack carried out by Mahameed took place around 5:30 p.m. on Friday on Sha'ar Hagay Street, near the Damascus Gate. The terrorist left the Temple Mount area and a few moments later encountered a team of police officers who were stationed there. He tried to stab one of them with a knife before being shot dead by the officers who were at the scene. No one was physically injured, but a Magen David Adom team of paramedics treated two women for emotional trauma. Following the attack, police forces arrived at the terrorist's home in Umm al-Fahm. They searched the area and interrogated relatives and neighbors of the terrorist.